5 reasons to bring your car to us for paint sealant protection. Five good reasons why you should bring your new car to us for protection. We cover every millimetre of exterior paint with a thick coating of the sealant -- it makes it hard work for us, but this is the way it should be done. 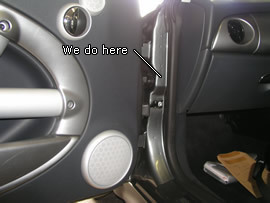 We have an eye for detail and pay special attention to those hard-to-do places such as around the fog lights and behind the door handles. We have so much confidence that these products do what they say on the tin, that we back the manufacturer's guarantee with our own guarantee. Any problems and all you need to do is call us. In the 18 years we have been applying them, the number of complaints we have had about sealants numbers zero! All done with a sealant product specially selected to be suitable for those areas, give lasting protection without leaving visible residue. This protects the areas where you push all the dirt when you wash your car. Initially they may receive less punishment, but over time they are often the place where corrosion starts. 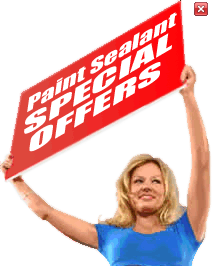 The person who meets you at the door will be the person who applies your sealant Package. They are fully trained and knowledgeable on the products and are happy to answer your questions and address your concerns. This way they'll be working to please the customer, rather than just putting sealant on another car. We carry a wide range of sealants. Not only do we carry the leading brands of sealant packages, we also have additional products for wheels, glass, metal, upholstery and fabric hoods. 6. As a Bonus, we always run special offers on selected products. advantage of the benefits of Paint Sealants. A range of protective coatings for every area of your car. Article: Has your new car got a future? A short article giving advice to new car buyers. Article: Industrial Fallout and Raildust? The damage, prevention and cure .